Dimensions 0 by 5 by 7 in. Amazon.com description: Product Description: From the inimitable woman who popularized Italian cuisine in America, Marcella Hazanâs simple and elegant manual on how to shop for the best ingredients and prepare the most delicious meals is a must-have for every home cook. When Marcella Hazan died in 2013, the world mourned the passing of the âGodmother of Italian cooking.â But her legacy lives on, through her cookbooks and recipes, and in the handwritten notebooks filled with her thoughts on how to select the best ingredientsâIngredienti. Her husband and longtime collaborator Victor has translated and transcribed these vignettes on how to buy and what to do with the fresh produce used in Italian cooking, the elements of an essential pantry, and salumi. Before you know how to cook, you must know how to shop. From Artichokes to Zucchini, Anchovies to Ziti, Ingredienti offers succinct and compelling advice on how to choose vegetables, pasta, olive oil, Parmigiano Reggiano, prosciutto, and all of the key elements of Marcellaâs classic meals. Organic isnât necessarily best, boxed pasta can be better than fresh. Marcellaâs authoritative wisdom and surprising tips will change the way you cook. Her clear, practical guidance in acquiring the components of good cooking is helpful wherever you choose to shopâin supermarkets, farmersâ markets, specialty food stores, or online. Based on sixty years of almost daily visits to the market to choose the ingredients of that dayâs meal, Ingredienti is a lifeâs work, distilledâan expression of Marcellaâs judgments, advice, and suggestions. Uncomplicated and precise, this volume will be essential to home cooks eager to produce meals in the same delicious style Marcella was the first to introduce to America. 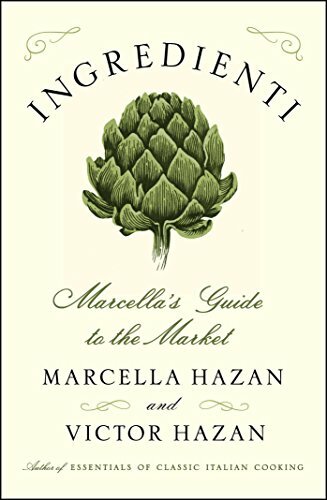 With Marcella Hazan | from Scribner (July 12, 2016); titled "Ingredienti: Marcella's Guide to the Market"
About: From the inimitable woman who popularized Italian cuisine in America, Marcella Hazan’s simple and elegant manual on how to shop for the best ingredients and prepare the most delicious meals is a must-have for every home cook.